2) You will be taken to the views and confirmations page. You’ll notice that there is a row for each person the call sheet was sent to. Select one or more people whom you wish to resend the email / text to and then click the “Resend to Selected” button in the header bar. If you wish to clear the view counts and confirmations for the recipients, check the box that says “Reset Confirmation and View Counts”. 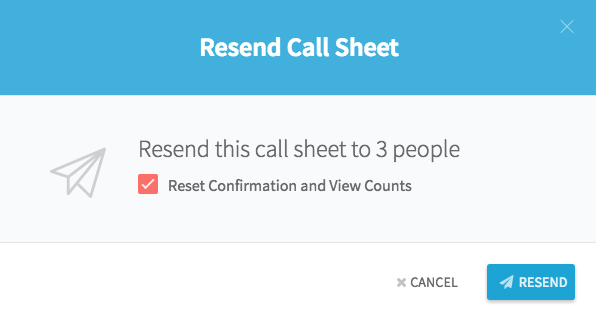 If you select this option, people who have already confirmed their call times will be asked to confirm their call time again. 4) When you’re ready, click the resend button and your messages will be sent. Note that re-sending will use the original settings for text / email. So if only emails were sent when originally publishing, only emails will be sent when re-sending, and likewise for texting.